Aries, May will turn into a golden mine, from which you can extract the wealth of immense value. But do not forget, it's just a metaphorical comparison. The horoscope for the fifth month of 2019 wants to highlight that it is not just the material wealth what matters; even though your fate is favourably inclined in this point. Aries may develop mental talent and spiritual abilities in the first place. Aries, you will tower like a single mighty oak on a green hill showered with sheep. Beware, however, to show your superiority too apparently. In May, the horoscope advises to focus on gaining insight (rich crown full of branches) and awareness of your own past (solid and deep roots). Thus you will gain strength and support and others will rest quietly in your love. Taurus, the horoscope reminds you that you should be watchful in May. It's not wise for people born in Taurus to stomp on the gas pedal. Rather enjoy a safe ride. Surprisingly, it can make you happy more than you would expect. However, this hint for the fifth month of 2019 should be perceived as genuine challenge to a smoother pace of life. Instead of trying to drive at full throttle, than brake sharply, you can comfortably use an imaginary train that is controlled by a true engine driver (oh, Taurus, just don't be stubborn and let others experiment and decide). Enjoy the ride. You will find that other procedures eventually lead to a desired goal as well as yours, even though making a detour. May is also a great opportunity for an important change, which may be a new job, date, or visit exotic travel. In the spring you will see many buds at orchard. They are important to give rise to sweet fruits later. Likewise, Gemini will have a wonderful chance to overcome fear in May; to harvest the crop of own courage in a few months. It does not matter whether you are afraid of snakes, spiders, heights, deep water, darkness or even confined space. From the whole year, the horoscope prefers May above all. Gemini, now is the right time to cross your own shadow. And another important thing. May also reminds Gemini that love is also a partly a bodily pleasure. With an empty stomach, love may disappear as quickly as the lizard can run away from a stone warmed by the summer. You can, of course, invite your mate to a unique dinner, let's say to an exotic restaurant where roasted caterpillars or Chinese "Century eggs" are served. However, whether you are a Gemini man or a Gemini woman, it will be very helpful to show how gentle and precise your hands are (in the kitchen, doing an intimate massage or elsewhere). Cancer. Forget about the safety net, that is often provided by a welfare state or a wider family. May, according to the horoscope, will become a month when you will taste a strange feeling, familiar to many detective stories, that someone is trying to scare or poison you. However, please stay calm. Most likely, nobody is trying to get rid of you by offering a hemlock drink. The point is that words can act as a lethal poison. Simply there are people who feel incredible pleasure when they can humiliate someone, scare or force to cry. In May the horoscope invites Cancer to find and reach the depths of your soul, to drink from the source of inner power that springs here. You will almost certainly face to some inconveniences, but remember that resilience and self-control you may demonstrate in challenging moments will give you a legitimate sense of heroism and self-esteem. In May, Leo will know what a real team fight means. The "team" may be a group of friends, colleagues at work, but also members of household who will not follow your well-intentioned advice; and all those who simply refuse to cooperate. Your "lion's" mind may soon get angry. However, instead of being especially wicked to retaliate, think of the pride you wear in your chest. The horoscope tells Leo to leave for a day, or to go on holiday, rather than giving notice of disagreements – or to tear a letter to pieces instead of sending a paper "revenge" for too much criticism and scrutiny. Well, Leo will keep his or her honesty and noble face only with a cold head, rather than drawing colts first. And Leo's honour will be the primary goal in May. 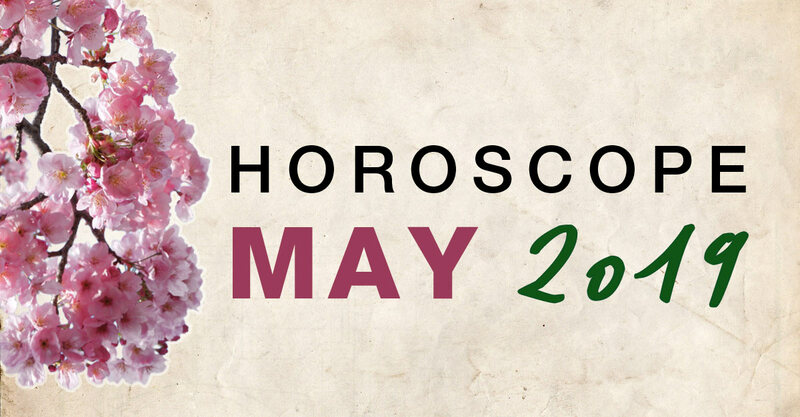 The horoscope for Virgo-born people shows that May is an opportunity to move from the stereotype towards original and unexplored territory of life. You can chop all furniture inherited from your grandparents, if it drives you mad by its unfashionable design; than burn it in the stove. You can stop using salt in the kitchen to live healthier and to understand the true meaning of the fairy tale called "Salt over Gold". Finally, you can start walking daily or start reading books instead of watching TV serials (a "TV detox"). Options are almost inexhaustible. However, it is clear that in May Virgo will be swallowed by some sort of mental storm demanding profound life change. (Change for the better, that is for sure!) Think, experiment and seek the best way how to shift the switch on the rails that you are driving round and round in the same circle all the time. Libra, if you felt like being in a jail (lack of freedom in motion or decision-making) at the beginning of the year, then be sure you will enjoy the fifth month of 2019 as a true liberation. In May, horoscope says, a whole new life story starts for Libra. The key words are: communication, change, activity, freedom, energy, speed (haste), experience, five senses. If your mind has been like a dark swamp where stinging thoughts were born like mosquitoes, you will now dry all the hopeless mud. The next days will be a lift into a glass skyscraper, where Libra will get a stunning view and elevating celestial impression. Family relationships, especially among siblings, have a chance to improve and strengthen. Scorpio, May is the time of farming. Nothing will help to calm your nerves as much as the countryside, all natural elements and the contact with original Earth's energy. The horoscope suggests that Scorpio does not necessarily have to drive a tractor or stand with forks on a dunghill as if he/she was Zeus alone, the mighty ruler of Olympus. Scorpio's horoscope predicts, in May nature will turn into a "church", that will give spiritual fulfilment and relief. People born in this sign may easily learn to read in flora and fauna as if it were an ancient bible. You will not want to ask others for permission and advice on where to go. Scorpio himself/herself will know where the sun rises and where the clouds are darkest. Sagittarius, if three stripes dominate to Adidas, your own new fashion collection will be happy with just one. We want to say: less is more. And it is you Sagittarius who can use this motto in love as well as in making attractive design. Sagittarius may become the dictator of inspiration! You can use talents to 100%. Sagittarius may excel and get the attention of the audience or of the person you love. Sagittarius may first give just a discreet sign and then clearly show that his / her charisma is a powerful magnet. Something invisible but very effective. As the May horoscope says: it is a good time to realize your dreams, to attract others, and to revise the resolutions you may have made on New Year's Eve. The half-time of 2019 will come soon and Sagittarius ha to kick off in a great manner. Roald Amundsen raised the flag when he reached the South Pole in 1911. In May 2019, Capricorn may not be afraid of cold winter, but he or she can still look forward to achieve success that may be well recorded in a selected chronicle. Capricorn, according to the horoscope, it does not matter whether you're going to create strong rock waves with a rumble of electric guitar, whether you dig up some ancient mystery, or whether you will just finally solve the problem of crowded wardrobe or messy household. During May Capricorn simply deserves to rise his/her own flag at the end of a successful journey. You do not have to be perfect in all respects (and certainly you will not be); it is enough if you accomplish one goal even better than you wished at the beginning of the month. It will positively affect your self-esteem and love. Aquarius, according to the horoscope for May 2019, it is necessary to prepare for various efforts of manipulation. Fake News can be just a morning exercise in comparison what struggle you will have to face if 1) your beloved will force you to believe that fish meat is or is not healthy at all, or 2) if your mother-in-law makes up her mind that your bond of marriage was a very unfortunate incident after all, or 3) if any from your colleagues decides that someone has to be blamed for all the failures, and it is best to be you! Well, maybe Aquarius has a lot of issues to think about. But what would life be worth if there were no challenges in it? The Horoscope confirms that in May Aquarius has all necessary prerequisites to overcome all the difficulties, and that will finally support your self-esteem or even pride. Pisces, if you will slip and break your knee on a stone in May, bet that you will find a four-leaf clover even in such accident. In other words, May 2019 is a happy month for Pisces. You have good chance to slim down if you are a bit overweight. Or to buy new jeans with a 50% discount if you are looking for a new one. Or, do not despair, if you have an unpleasant feelings, like someone would have suddenly turned off the light in the middle of a department store, where you are shopping. The new direction will appear as bright as it would be a long strip of LEDs leading up to the cash registers – as a genuine shining airport runway. But Pisces, you will not pay anything! No one would pay a retailer who sends people to the darkness. The horoscope tells us that despite harvest is still far away, Pisces are waiting for a rich mental yield in May.